Irene Ella Ott Skruby, age 93, of Port Washington, WI passed away peacefully Thursday, January 19, 2017 at the Harbor Club where she had resided since 2012. 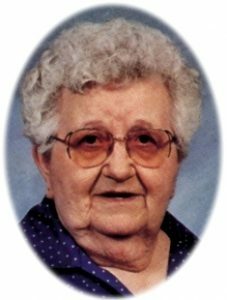 She was born on June 26, 1923 in Menno, SD; daughter of Ferdinand and Josefa Rolof Ott. She moved to Port Washington in 1940 for a job opportunity at the Port Washington Chair Factory. On April 22, 1944, Irene married William F. “Willie” Skruby of Port Washington at St. Mary’s Parish in Port Washington. He preceded her in death on November 4, 1976. Over the years, Irene worked at Bolens Mfg. Company in Port Washington and clerked for the former Excelsior Dry Cleaners (current site of the Pasta Shop) in Port for almost 20 years. Irene was a skilled seamstress. She made clothes for herself, her nieces and did alterations for many. She made many beautiful quilts. She was a regular at Harry’s Restaurant for many years. Irene was serious when it came to crossword puzzles. She subscribed to the New York Times and Chicago Tribune just for the puzzles. She is survived by her sister Vivian (the late Jim) Miller of Port Washington; sister-in-law Bette (the late Phil) Ott of Grafton; nieces Diane (Charles) Linden Scudder of Newport News, VA; Nancy (the late James) Linden Kartheiser of Cedarburg, Lori (James “Skeeter”) Linden Ashworth of Milwaukee and Susie Ott Hamer; nephews Dan Linden of Cedarburg, Scott Ott and Steven Ott; other relatives and many friends. Irene is preceded in death by her husband Willie, a baby daughter at birth, sisters Ida (the late Tony) Skridla and Leona (Hardus) Veen, brother Phil Ott, brother-in-law Jim Miller and nephews Charles Veen and Jerome Linden Jr.
Funeral services will be held 1PM Saturday, January 28, 2017 at the POOLE FUNERAL HOME/Crematory, 203 N. Wisconsin Street, Port Washington, WI. Reverend John Klieve of St. John Lutheran Church, Port Washington will officiate. Family will receive relatives and friends from 11-1PM Saturday at the funeral home prior to the service. Interment Union Cemetery, Port Washington. Memorials to St. John Lutheran Church, 217 N. Freeman Drive, Port Washington, WI 53074 appreciated. Heartfelt sympathies from the Nenn family. Many wonderful memories have been passed on from Barney and Helen’s daughters’ to their children and grandchildren about The sisters and Grandma Ott. Vivian, I am so very sorry for your loss. Irene was kind enough to call me when Isobell passed away. She sounded so good at that time. please accept our most heartfelt sympathies for your loss…our thoughts are with you and your family during this difficult time. We realize that no words of comfort are quite enough to replace the loss. Your niece Gertrud and great-niece Lilli (Carl Arthur) from Germany, Mönchengladbach.